← Thumbs: Brown or Green? It seems that I’ve run into a strong bout of finishitis over the last few weeks. Several WIPs have come out of hiding to get that final push to the finish line. The pi shawl is no exception. I was able to work on it exclusively for several days, which was really all it needed. For those of you following along, I wrote about the first and second sections here and here. Here’s a peek at the pattern for the third round. This round is a little more linear and a little less open than I was expecting, but I’m still happy with it. 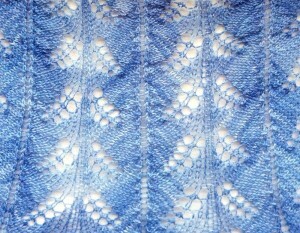 The frond-like lacework is making me think of mid-spring leaves and blooms, which is what I was trying to capture here. And here is a peek at the pattern for the fourth round. You weren’t expecting that, were you? Yes, I can be a rather speedy knitter when I’m on a mission and not distracted by shiny new projects. 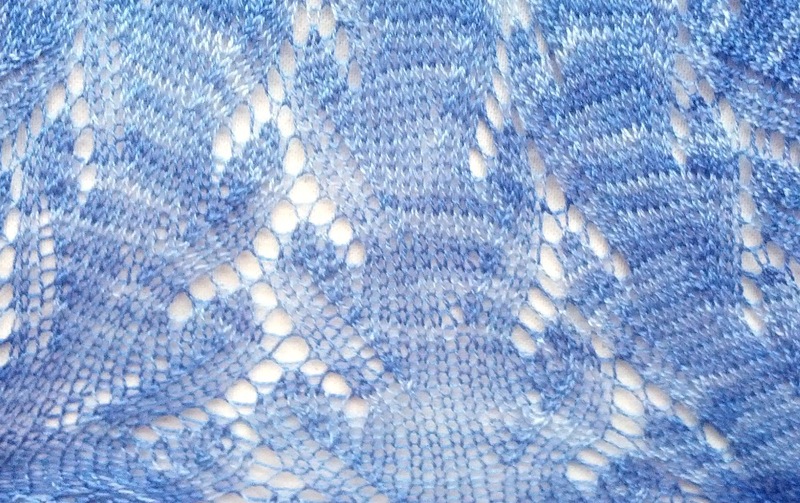 This fourth section is where I’m a little less certain about how the shawl will look once blocked. 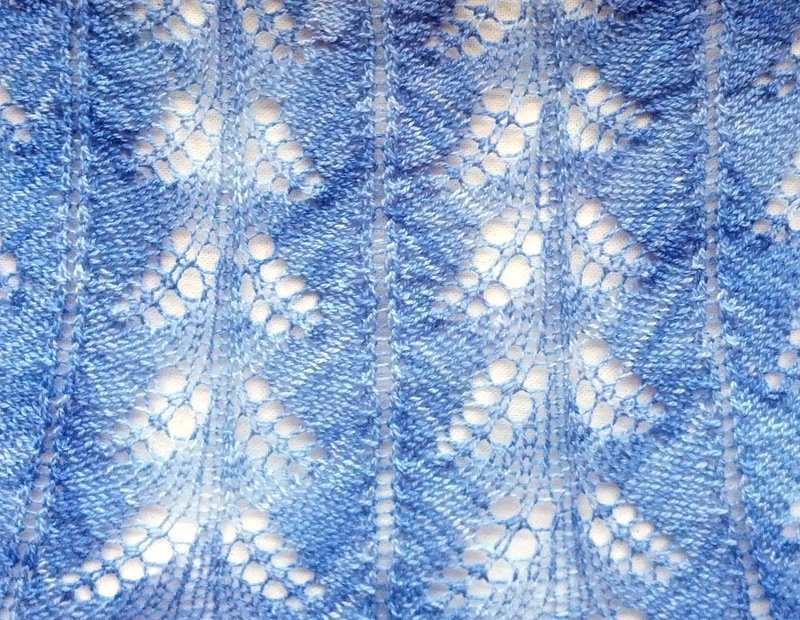 I really like the lace pattern – it’s evoking exactly the feeling I wanted, and it’s nice and heavy to keep the shawl from feeling like it will float away. What I’m not sure about is the transition line from the third to the fourth section. You can’t see it in the photos, but that line is very ruffly. I hate ruffly…with emphasis…a very strong hate. Playing with the lace in my hands, I can’t yet tell whether this ruffling is a result of the two lace patterns interacting with each other, or if it will all block out smoothly after a nice soak in the bath. This is one of those instances where I’ll just have to try it to see what happens. I also spent several hours trying to gauge where to end the fourth section, and how best to transition to and then work the edging to finish the whole thing off. I had originally wanted a heavy, thick edging. 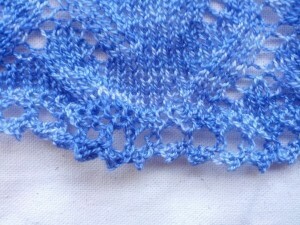 But once I saw the lace sections worked up, I decided that a heavy border would be too much. 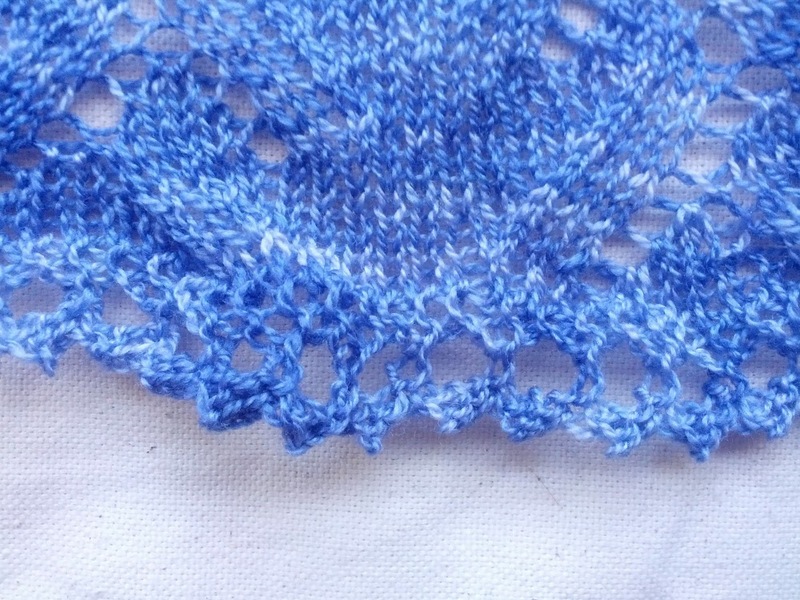 I worked out a small, knitted-on picot edge that ended up being just right. Of course, I knitted that transition no fewer than four times! I was weighing my yarn ball for the last few repeats of the fourth section, trying to determine how far I could go to use as much of the yarn as possible while leaving enough for the edging. First I stopped too soon. Rip! Then I didn’t like the increase row before the edging. Rip! 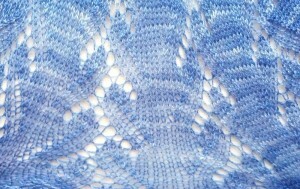 Then I didn’t like how the increases made the edging ruffle. Rip! Finally, it was just right. Yay! It’s a good thing I am not afraid of ripping and reworking! I’m planning a big washing/blocking day soon. Then we’ll see if all of this experimentation turned out like the vision in my head. Fingers crossed!